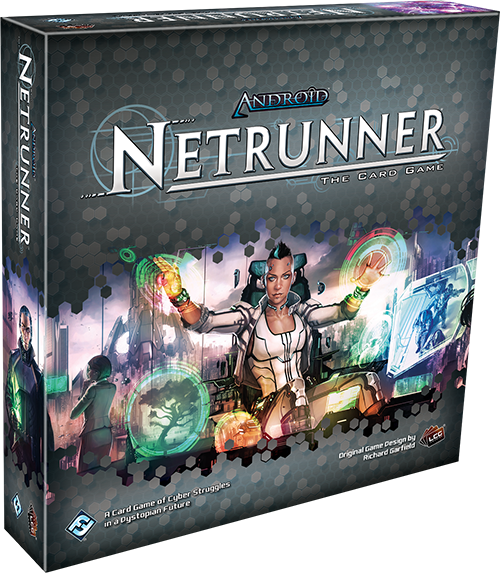 It's an exciting time to be a fan of Android: Netrunner. 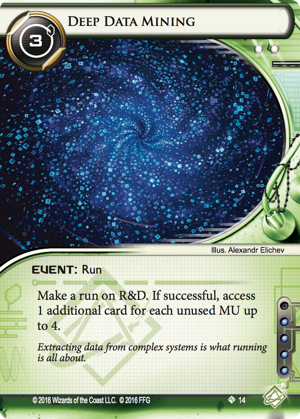 Rotation and the announcements of the Revised Core Set, the Kitara Cycle, and the new Most Wanted List (pdf, 5.8 MB) have dramatically altered the game's landscape. You still have hoppers racing overhead. Virt displays continue to burst to life with sound and color as they register your PAD. And you'll stil find the Beanstalk shooting up from the heart of New Angeles. But at the street level, many things have changed. 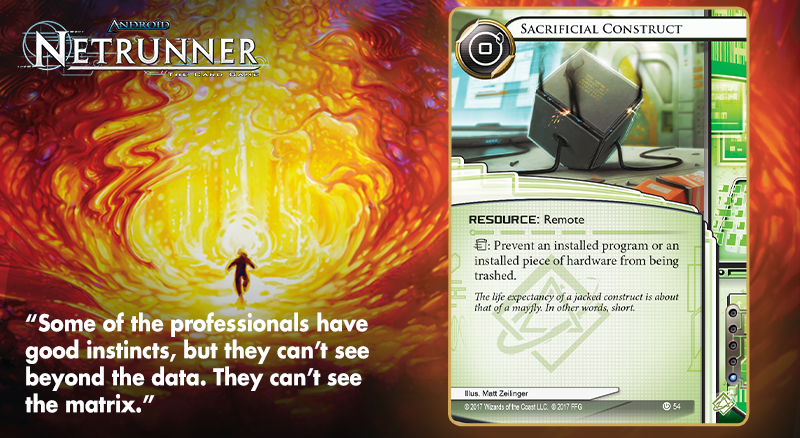 The game's Corps and Runners continue to go about their business—waging high-stakes duels for control of valuable data—but the players have changed. They've aged. There have been promotions, demotions, and disappearances. This is a time of tremendous change. Chaos. Potential. 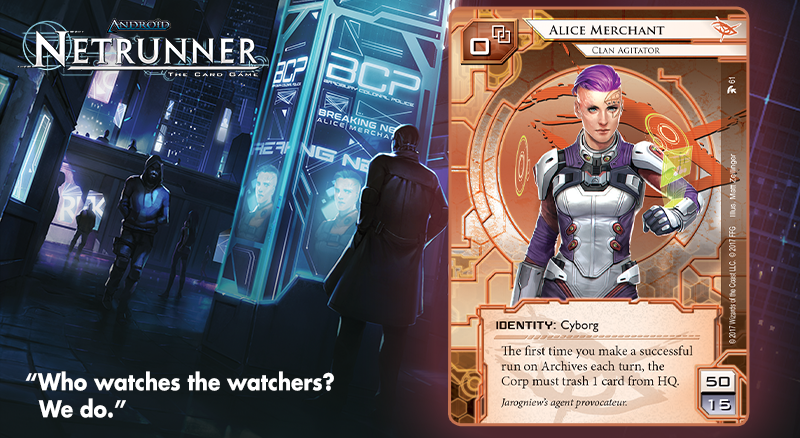 With the Android: Netrunner 2017 World Championships fast approaching, the Corps and Runners who can best adapt to the changing environment stand the best chance of ruling and reshaping the Net. 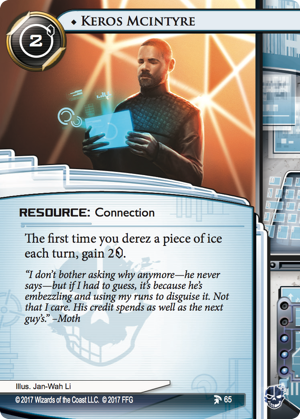 What do you see in the future of Android: Netrunner? How can you unlock its potential? To help us answer these questions, we turned to 2016 World Champion Chris Dyer. 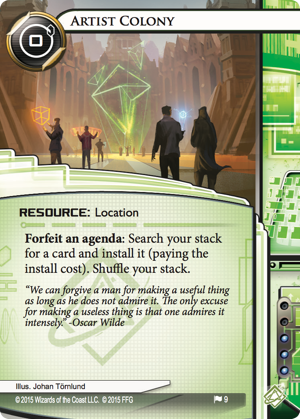 The recent changes—including the rotation of the first two Data Pack cycles, the introduction of the Revised Core Set, and a completely overhauled Most Wanted List—have provided a totally fresh Android: Netrunner play environment. That makes things exciting, and the first significant tournament to be played under these rules will be the 2017 World Championships, which will provide a fantastic advert for the revitalized game and a true test of skill for those attending! 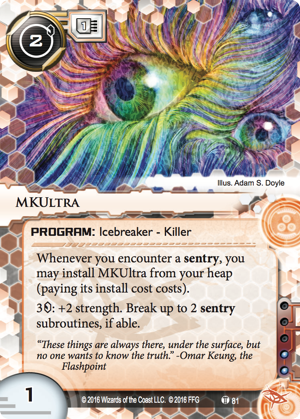 As we look toward Worlds, let's take a guess at what each faction will look like by the time of the tournament, starting today with some general thoughts about the larger metagame and then a look at the Runner facitons. There are some very significant changes coming with rotation and the Revised Core Set that promise to fundamentally impact the way that players build their decks and play the game. 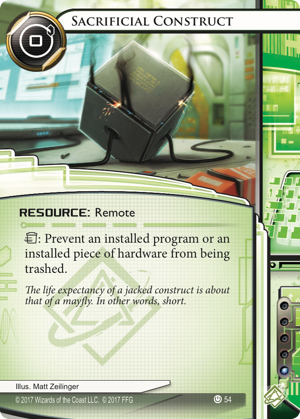 The game looks to be a little bit slower, as some of the more explosive cards, economic options, and powerful combinations will no longer be around. 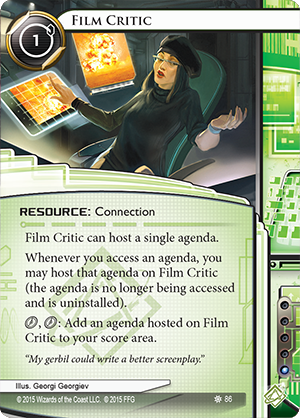 I expect to see games average a couple of turns longer than they used to, and decks that take a bit longer to build toward a powerful late-game should be more viable. The natural counter to this is for Corporations to try to go faster and score quickly, if they can. 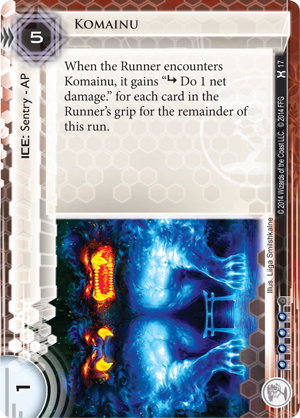 The removal of Yog.0 and Parasite means that some ice, especially low-strength, high-impact ice like Komainu (Honor and Profit, 17) and Fairchild 2.0 (Blood Money, 31), will see a lot more play than they did before. Runners will need sustainable solutions to this type of ice, plus the economy to support them. The rotation of Account Siphon, Vamp, and Medium significantly reduces the pressure and disruption that runners place on central servers. Corps can respond by defending centrals less and being more aggressive when creating and icing remote servers. Jackson Howard, who for years has been the most reliable way to deal with early hands containing too many agendas, is gone. Corporations will need to find another way to deal with agenda flooding or pursue more aggressive strategies that prefer to see agendas early. 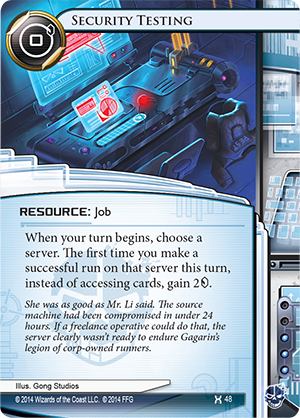 Runners can respond by trying to make the Corporation’s scoring plans difficult, and picking off the agendas as they build up in HQ. 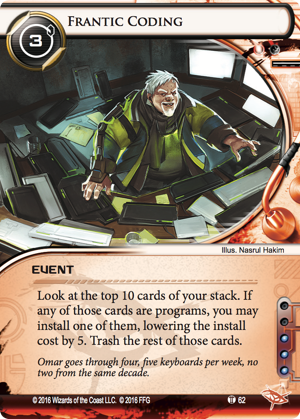 The sweeping changes made by the new Most Wanted List also promise to have a huge impact on deckbuilding and gameplay. Previous iterations of the list raised the influence cost of certain ubiquitous or overpowered cards, while this new list flat-out removes the most problematic cards while simultaneously aiming to break up oppressive combinations and increase diversity in deckbuilding. 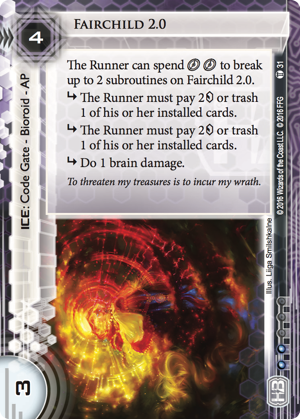 The most notable hit on the runner side is to economy, with all of the most powerful and sustainable options having either been Removed—Temujin Contract and Bloo Moose—or Restricted— Aesop’s Pawnshop (Revised Core Set, 52) and Magnum Opus (Revised Core Set, 50). 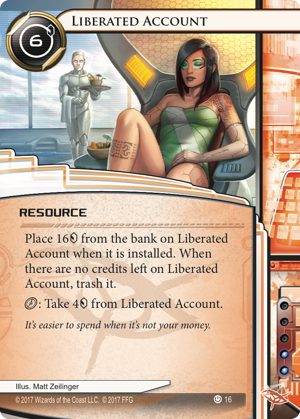 Corp strategies that aim to economically tax the Runner had recently fallen out of favor, but these changes promise to make those decks viable again. 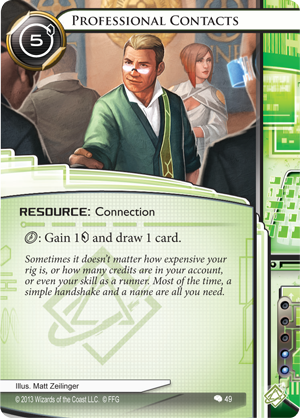 On the other side of the table, Runners will have to think much more carefully about their economy engine while building their deck, and may need to spend influence or jump through a few hoops to make their decks as reliable as possible. 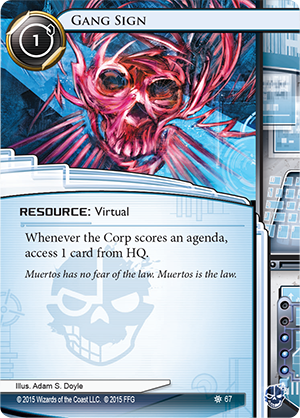 On the Corporation side, the Most Wanted List has primarily hit asset-based decks, removing several key components and restricting others. Before the announcement of the new Most Wanted List, these strategies looked like they might be even better post-rotation since their natural predator, Whizzard, was no longer an option. 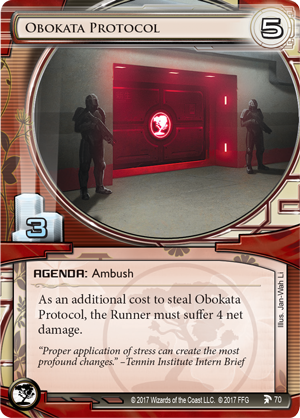 I think that the Most Wanted List has done a good job of making pure asset strategies untenable, which should allow more freedom in deckbuilding and more exciting game play. The other significant impact is on agenda suites, with Global Food Initiative (Data and Destiny, 26) and Obokata Protocol (Blood and Water, 70) both Restricted. 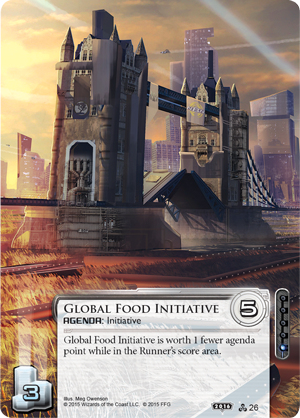 Global Food Initiative, in particular, has featured in ninety-nine percent of competitive decks since its release, but the opportunity cost of putting it in your deck means it will now be a bit rarer, though still very well represented. Expect to see a bit more diversity in the Corporation's agendas. The Most Wanted List has another, subtler impact, as well. Players don’t need to spend additional influence for cards on the list, which means that they will have a bit more influence to spend during deckbuilding. 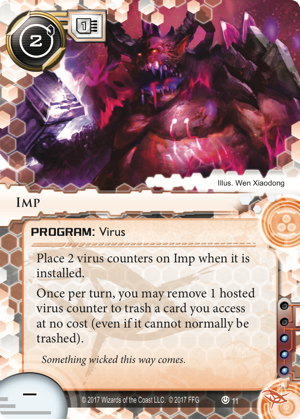 As a result of this, you should expect to see more high-influence, high-impact cards splashed across all the factions. It also means that players will have some more flexibility to import basic requirements, like economy or breakers, that their faction may be lacking. So what do these changes mean for the game's Runner factions? Read on! The competitive game has long been dominated by Anarchs in one form or another, but the faction now needs to find a dramatically new look. All of the existing archetypes have lost fundamental elements of their decks—whether it’s Yog.0, Parasite, and Medium which helped power the "regular" Anarch decks or the Account Siphon, Keyhole, and Data Leak Reversal that fueled the more aggressive builds. In addition, Whizzard—by far the most common Runner identity at tournaments for the past two years—has now rotated out of the game. 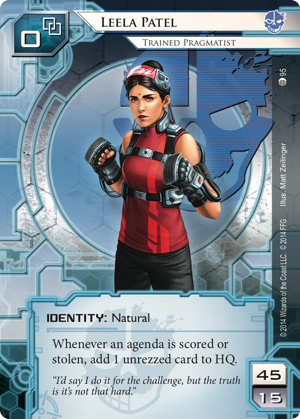 As a result, new wave Anarch decks are likely to focus on the faction’s ability to pressure centrals and disrupt the Corporation’s game plan. 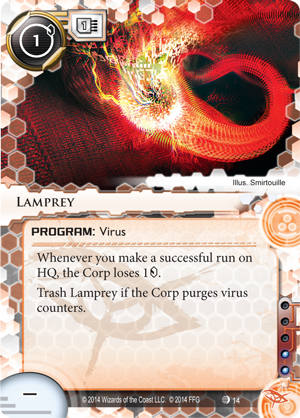 There are a wide range of powerful cards—such as Mining Accident (Crimson Dust, 101), Lamprey (Upstalk, 14), Imp (Revised Core Set, 11), Maw (Daedalus Complex, 2), Datasucker (Revised Core Set, 9), and Bhagat (Fear the Masses, 98)—that all support this theme. 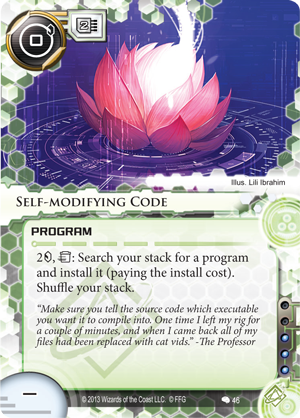 There are also several good identities for the deck, including Alice Merchant (Blood and Water, 61), Edward Kim (Order and Chaos, 3), and Reina Roja (Revised Core Set, 1). 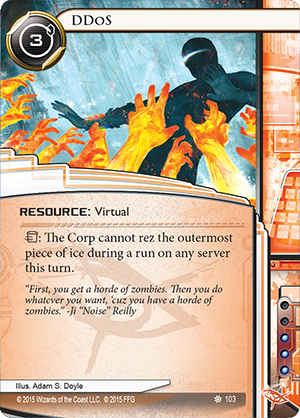 The one element that the faction really lacks is a way to translate this disruption in to victory, so players will likely need to import cards like Indexing (Revised Core Set, 39) or HQ Interface (Revised Core Set, 26) to prop up this part of their deck. 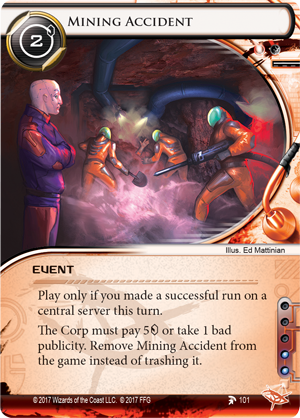 Players might also find success by using Frantic Coding (Intervention, 62) to install Magnum Opus early and place the "conspiracy breakers"— Black Orchestra (Escalation, 42), MKUltra (Martial Law, 81), and Paperclip (Blood Money, 24) in the heap. The advantage of this deck is that it has strong economy and can quickly threaten remote servers, making it a strong answer to rush decks. 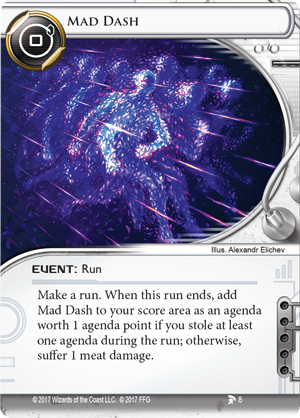 The new Most Wanted List has also returned DDoS (The Universe of Tomorrow, 103) as an influence-free card for Anarchs, which opens up a few options like decks built around Apocalypse (Data and Destiny, 30) to create huge swings in board state. 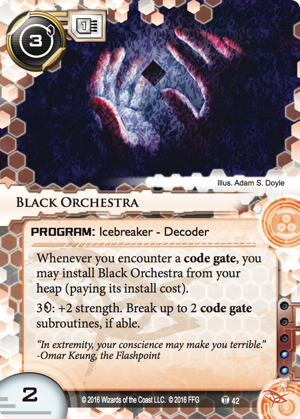 The fact that both DDOS and D4v1d (The Spaces Between, 33) are once again free to Anarch decks gives the faction a much needed boost and makes them an intriguing proposition for deckbuilders. All in all, I suspect that the World Championships is likely to come a month or two too soon for Anarchs. 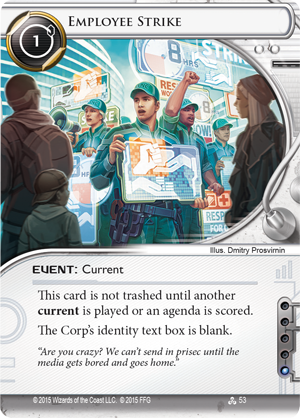 I think they have a really strong faction identity, and I’m excited to see what they get from the next cycle. But I think they probably need those cards to round them out. 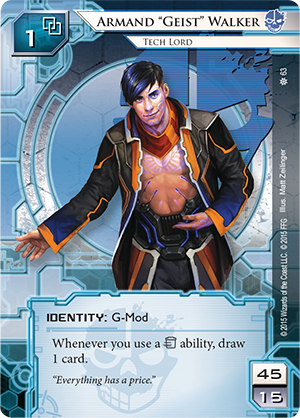 I still expect them to be a popular choice at the World Championships, but would be surprised if there were many Anarch decks left towards the sharp end of the tournament. 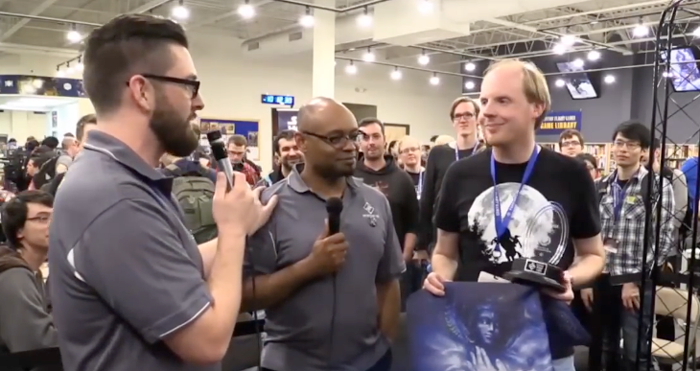 Towards the end of the Red Sand Cycle, Andromeda decks started to gain popularity, picking up wins at several Nationals events and the North American Championship. 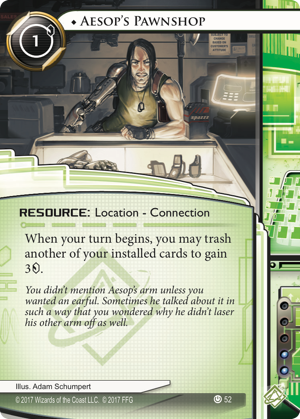 Those decks have taken a significant hit, losing cards that have long formed the very core of the deck—Account Siphon, Desperado, and Andromeda herself. This means Criminal players will need to look in a new direction for Worlds. All is not lost, though. Cards like Legwork (Honor and Profit, 35), HQ Interface, and Gang Sign (The Underway, 67) provide an element of HQ pressure that should prove even more valuable now that Jackson Howard has rotated, especially if players can find enough ways to slow the game down and disrupt scoring. 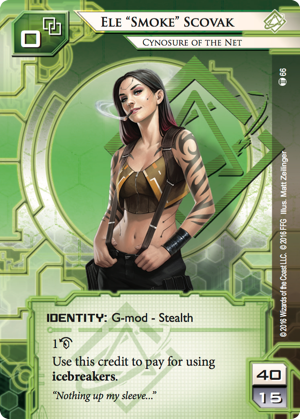 And while that may prove tricky without Account Siphon, there are still plenty of Criminal cards to threaten remote servers and make it difficult for the Corp to rush agendas, especially with the Leela Patel identity (All That Remains, 95). 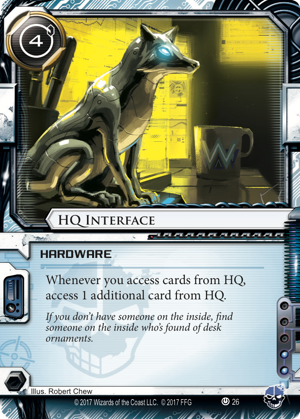 It’s even possible that corporations will defend HQ less than they have in the past, making this faction’s key strength in that area more potent. The other hurdle that Criminals will need to overcome is their economy, which has long relied on Temujin Contract and, more recently, Bloo Moose. 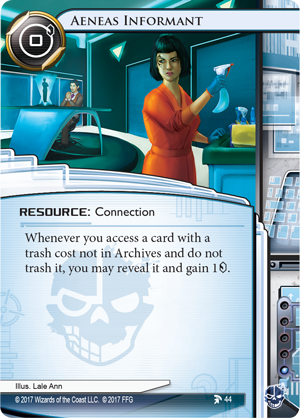 Both cards have been removed by the Most Wanted List, meaning that players will have to find alternatives or import solutions from other factions. 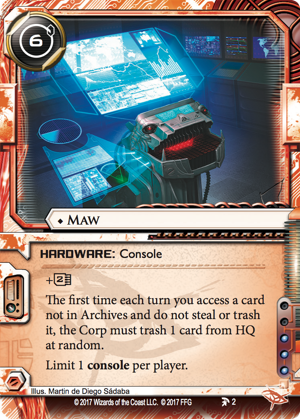 Tapwrm (Quorum, 104) may be the strongest in-faction answer, but they are also likely to import cards like Liberated Account (Revised Core Set, 16) or even Magnum Opus. 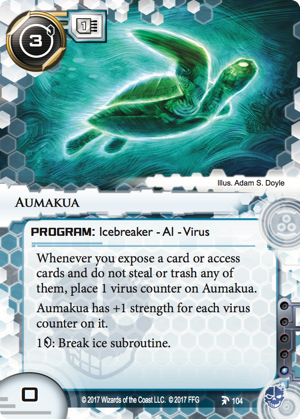 They also have a range of cards like Aeneas Informant (Earth's Scion, 44), Security Testing (Honor and Profit, 48), and Aumakua (Crimson Dust, 104), which can punish open remotes and may provide Criminals with a solution if asset-based decks continue to prove strong. 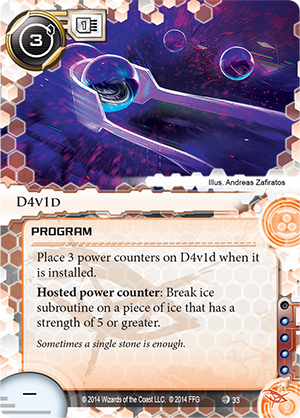 The Red Sand Cycle also focused on de-rezzing ice as a key mechanic, with cards like Rubicon Switch (Earth's Scion, 43), Los (Station One, 25), and Keros McIntyre (Blood and Water, 65) providing the core of a very synergistic deck. Although Crescentus has rotated out, Emergency Shutdown (Revised Core Set, 21) remains and adds a bit more punch to this archetype. 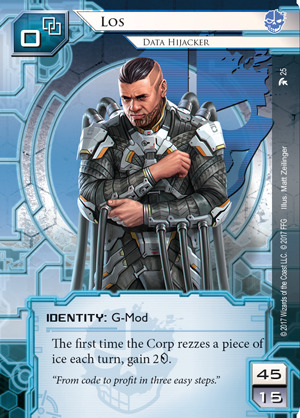 The other Criminal to consider is Armand "Geist" Walker (The Underway, 63), who saw a key card preserved in the form of Fall Guy (Revised Core Set, 35). 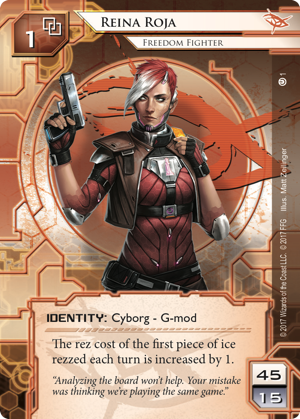 Geist was the one Criminal ID that usually did not use Desperado or Account Siphon, and is, therefore, in a stronger position than most post-rotation. Geist also tends to benefit from a slower game, as he is extremely strong once he’s fully set-up. 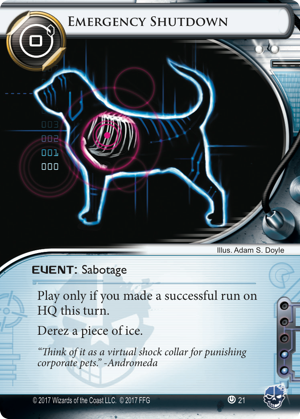 Ultimately, the success of Criminal decks will depend largely upon which Corporation decks are most popular. Geist looks to be the strongest deck that they have available, but he often struggles against quick or rush decks. 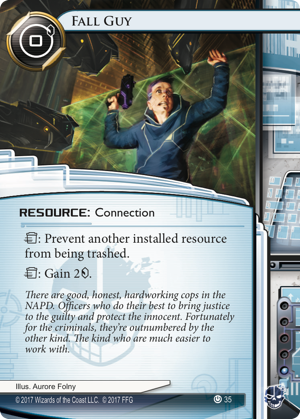 Criminals have decent decks available to them, but they may not be best placed to exploit the field. At first glance, Shapers appear to be the big winners of the announced changes and look set to dominate the first few tournaments post-rotation. They already had a range of existing viable decks, most of which used Faust to answer early rush strategies before building a more traditional rig late game. And while those decks were neutered by the Most Wanted List and its removal of Faust, Shapers still have plenty of options going forwards. 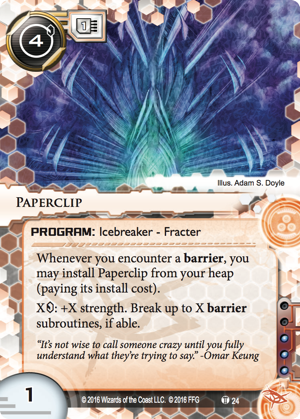 The Most Wanted List also restricted a range of Shaper cards, meaning that players will have to think long and hard about which one to include. 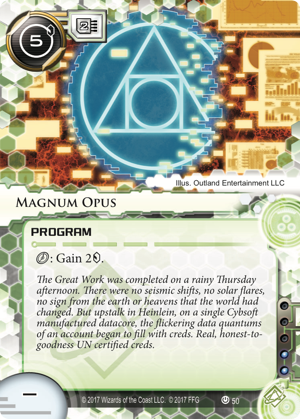 Magnum Opus is likely to be a popular choice, because it provides all the economy a Runner needs without taking too many card slots. There are a range of other economy packages available, though, with Professional Contacts (Creation and Control, 49) likely to prove popular. 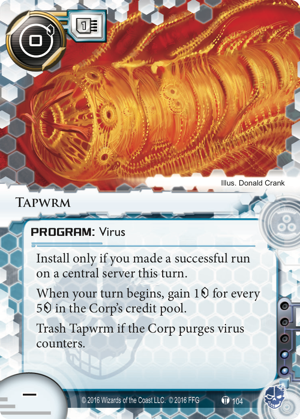 Shapers can also import Tapwrm for additional income—and it's a card they are well positioned to exploit as Sacrificial Construct (Revised Core Set, 54) is also commonly played. 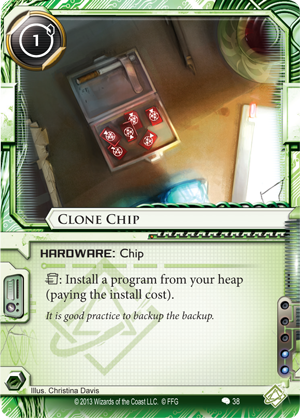 Avoiding Magnum Opus will let Shapers take Clone Chip (Creation and Control, 38) as a restricted card to give them greater flexibility, Film Critic (Old Hollywood, 86) to counter some Weyland or Jinteki strategies, or Employee Strike (Data and Destiny, 53) to give them general protection against a range of decks. Ultimately, I expect all of these choices to be viable, which goes to show just how much flexibility the faction has after rotation. The obvious biggest hurdle for the faction to overcome will be the rotation of Kate McCaffrey. On the other hand, there are several other identities with strong abilities that are already seeing play. 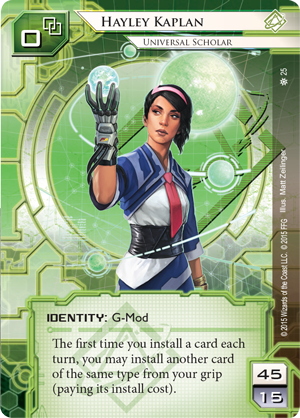 These identities, however, require a bit more focus during deckbuilding, but cards like Deep Data Mining (Terminal Directive, 14), Indexing, and Mad Dash (Daedalus Complex, 8) grant Shapers the strongest R&D pressure in the game—and I expect other factions to lean on some of these cards, as well. 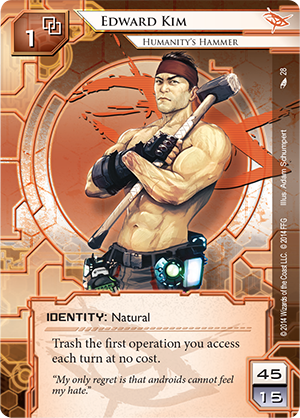 Because they have such a wide range of toolbox cards, Shapers always tend to do well in an uncertain environment. 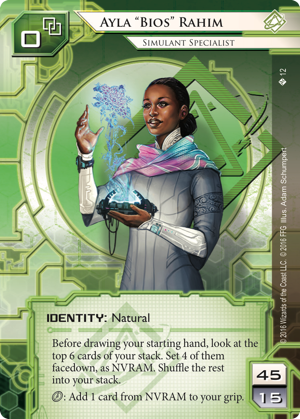 They can search their decks with cards like Artist Colony (Kala Ghoda, 9) and Self-modifying Code (Creation and Control, 46). These allow Shapers to play flexible decks that can dig out answers to a range of archetypes—the perfect sort of deck for a large tournament where people aren’t sure what the strongest deck is! 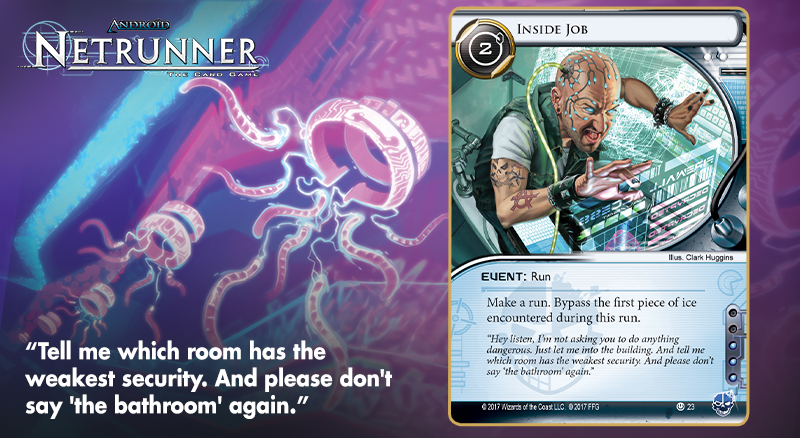 I expect to see a wide range of Shaper decks doing well at Worlds, played out of Ayla "Bios" Rahim (Terminal Directive, 12), Hayley Kaplan (Breaker Bay, 25), and Ele "Smoke" Scovak (Intervention, 66)—all of which will aim to make scoring out of a remote server difficult before building up late-game inevitability through an efficient rig and some choice multi-access cards. 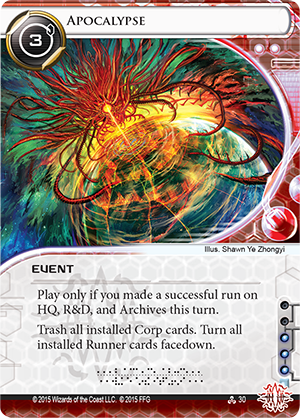 In the end, Shaper can support a range of diverse strategies such as combo, stealth, Apocalypse, and Security Nexus (Data and Destiny, 47), and all look to be competitive come Worlds. And What of the Corporate Response? 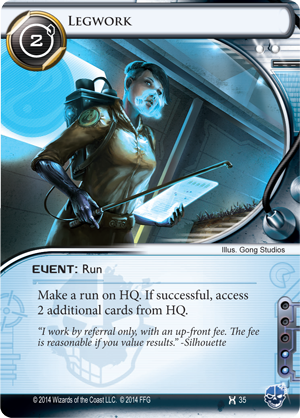 Now that Chris has profiled the post-rotation Runners, you can bet that all the game's top Corporate executives are placing calls to their chief officers, sysadmins, and… independent contractors. 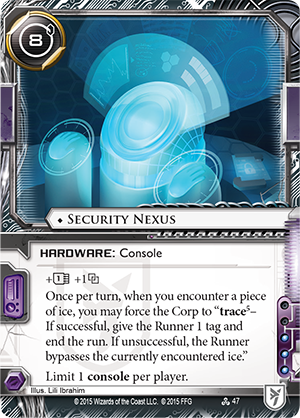 Which of the game's Corps will respond most effectively to the new Runner threat? We won't know for certain until the World Championships on November 5th, but Chris will return shortly to offer his take on what each of the Corps has to offer. 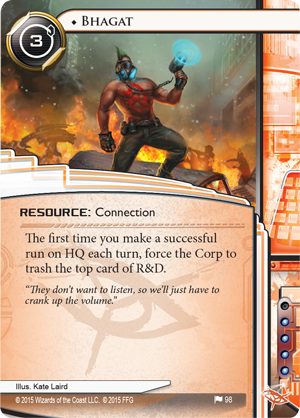 Until then, head over to our community forums and share your thoughts on what the Revised Core Set, rotation, and the new Most Wanted List have brought to your games of Android: Netrunner! 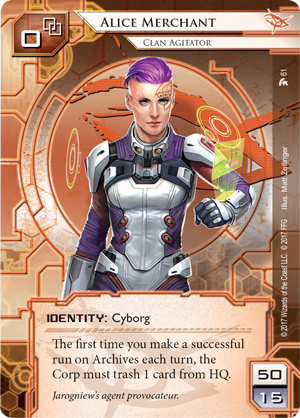 You can pre-order the Revised Core Set (ADN49) at your local retailer or online through our website today!